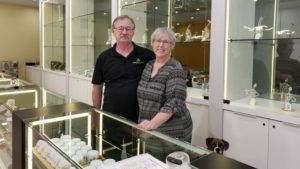 Celeste Gerber, co-owner of the cannabis retail store in Swift Current, Sask., said that her own experience using medical cannabis for pain relief led her and her husband Ron to move from Calgary to Swift Current, Sask. to open their own cannabis retail store, Dream Weavers Cannabis Products, Inc. Celeste first used cannabis after she was diagnosed with breast cancer and began going to the hospital for chemotherapy. Although the traditional pain medications she was given worked well, she didn’t like the side effects. “After my second chemo treatment I was just completely and absolutely stoned from the drugs they were giving me at the hospital. They worked really well, but I just wasn’t feeling like myself,” she said. A friend had gone through the same experience and recommended cannabis edibles. They were cannabis-infused candies – watermelon flavour, to be precise. She didn’t try them until she began treatment. When the side effects of the pain medications became apparent, she tried one of the candies just to see. “It was like the clouds parted and the sun just poured down on me. It was just wonderful,” she said. Not only did she become a believer, she wanted to help make it easier for others to get medical cannabis as well. She and her husband applied for four licences in Saskatchewan’s cannabis retail store licence lottery (similar to Ontario’s cannabis retail store licence lottery). They won one in Swift Current, and were happy to move back to their home province. Dream Weavers opened in downtown Swift Current on December 31, 2018. Gerber said that for the most part, everyone had been “overwhelmingly friendly” despite some concerns about opening in the downtown core. She is pleased that doctors are recommending to certain patients purchase product. However, those little watermelon candies that started it all won’t be on the shelves anytime soon. Health Canada recently announced its proposed regulations for cannabis edibles in December 2018.